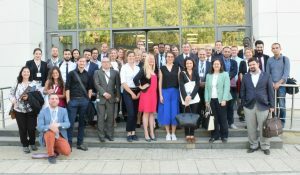 The joint Conference “New political challenges for Germany Turkey and EU” which was organized by the INSITER in cooperation with the CETEUS / University of Cologne, the Turkish-German University, FEUTURE Project and DAAD, took place on May 26, 2016 at the Turkish-German University. 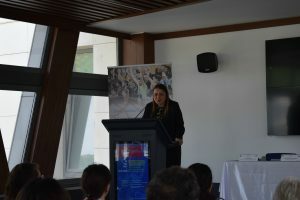 The opening keynote speech was addressed by Saadet Oruç Senior Advisor to the President of the Turkish Republic and, following the speech three thematic panels related to EU-Turkey relations took place. The first panel “Present and F(e)uture of EU-Turkey Relations (in cooperation with the FEUTURE project)” was chaired by Asst. Prof. Dr. Wulf Reiners (Turkish-German University). With the participation of Assoc. Prof. Dr. Bahar Rumelili (Koç University), Doruk Ergun (Centre for Economics and Foreign Policy Studies / EDAM, Istanbul), Asst. Prof. Dr. Ebru Turhan (Turkish-German University) and Prof. Dr. Wolfgang Wessels (CETEUS, University of Cologne) as panelists, Present and F(e)uture of EU-Turkey Relations was discussed in view of internal and external dynamics affecting both EU and Turkey. The second panel “EU, Turkey and the Economy” was chaired Prof. Dr. Ferda Halıcıoğlu (Medeniyet University). With the participation of Prof. Dr. Martin Klein (University Halle-Wittenberg), Assoc. Prof. Dr. Çigdem Nas (Economic Development Foundation Istanbul), Assoc. Prof. Dr. Elif Nuroglu (Turkish-German University) the economic aspect of Turkey-EU relations was discussed. The third panel “New Actors, New System, New Era? World Politics 2017” was chaired by Asst. Prof. Dr. Enes Bayrakli (Turkish- German University). With the participation of Prof. Dr. Atila Eralp (METU), Asst. Prof. Dr. Deniz Kuru (Turkish- German University) Johannes Müller Gomez (CETEUS, University of Cologne) Assoc. Prof. Dr. Dimitris Tsarouhas (Bilkent University) the dynamic relation between the globalization and international system was discussed. Finally with the concluding remarks of the INSITER Co-Coordinators Asst. Prof. Dr. Ebru Turhan (Turkish-German University) and Asst. Prof. Dr. Wulf Reiners (Turkish-German University), the “Conference Findings” session ended. In coordination with the Istanbul Policy Center (IPC), INSITER organized INSITER- IPC Roundtable titled “A new neighborhood for everyone? Trends of transition in Turkey, the EU and the wider region” on March 25, 2017 at the headquarters of the IPC, Minerva Han, Istanbul. Following a welcome speech by Prof. Dr. Fuat Keyman, Director of the IPC and Professor at the Sabancı University, the panel was chaired by the INSITER Co-coordinator Asst. Prof. Dr. Ebru Turhan and included contributions from Assoc. Prof. Dr. Senem Aydın-Düzgit, IPC Senior Scholar & Research and Academic Affairs Coordinator and Associate Professor at the Sabancı University; Prof. Dr. Atila Eralp, Middle East Technical University, & Turkish-German University; Assoc. Prof. Dr. Dimitris Tsarouhas, Bilkent University and Prof. Dr. Wolfgang Wessels, CETEUS | University of Cologne & Turkish-German University as panelists and Asst. 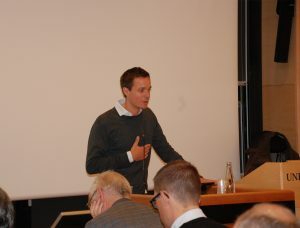 Prof. Dr. Wulf Reiners, INSITER Co-coordinator, as a key discussant. More than 40 representatives from German and Turkish academia and civil society participated in the roundtable. 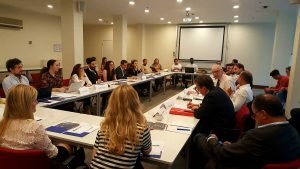 On May 24, 2017, the last session of the INSITER seminar “Contemporary EU-Turkey Relations” took place. The course was added to the Turkish-German University’s MA programme “European and International Affairs” as a new teaching offer (seminar code ‘AVU114’) in the framework of the INSITER project; classes had started on February 15. The seminar was conducted by the INSITER co-coordinators Asst. Prof. Dr. Ebru Turhan and Asst. Prof. Dr. Wulf Reiners and will be concluded with the submission of the students’ seminar papers by May 28. 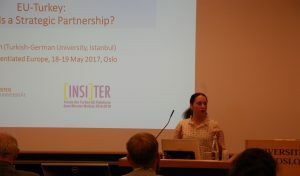 On May 18 and 19, 2017, the INSITER co-coordinators participated in a joint conference of the Centre for European Studies (ARENA) of the University of Oslo, the Cologne Monnet Association (COMOS) and the Centre for Turkey and EU Studies (CETEUS) of the University of Cologne that took place in Oslo, Norway. Under the conference title “Towards a differentiated Europe” the event dealt with recent developments inside the EU, joint challenges for the EU and Norway as well as the future ties of the EU to non-member states, particularly Norway, the UK and Turkey. In this context Asst. Prof. Dr. Ebru Turhan and Asst. Prof. Dr Wulf Reiners contributed to the panel on “Alternative Forms of Partnership of and with the EU” and presented the INSITER project. 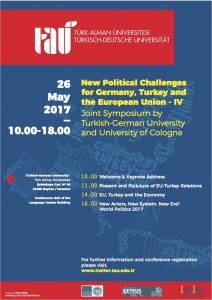 Also on behalf of CETEUS / University of Cologne and the Turkish-German University INSITER invites you to participate in the Joint Conference “New political challenges for Germany Turkey and EU” on May 26, 2017. 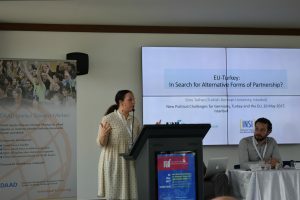 The conference takes place in the premises of the Turkish-German University in Istanbul (get directions here) and will bring together scholars from both Turkey and EU countries who are engaged in EU studies and Germany –Turkey relations. A draft agenda can be found here. Participation is possible only upon successful registration. In order to register please return the completed registration form (download here) by May 19, 2017 (extended deadline) to Çigdem Çelik (celik@tau.edu.tr). A draft agenda can be found here. Participation is possible only upon successful registration. In order to register please return the completed registration form (download here) by May 14, 2017 to Çigdem Çelik (celik@tau.edu.tr). From May 4 to 6, 2017, INSITER Co-Coordinator Wulf Reiners participated in the Fifteenth Biennial Conference of the European Union Studies Association (EUSA) in Miami, FL. Together with Dr. Funda Tekin (CETEUS, University of Cologne) he presented a conference paper on Germany’s role in EU-Turkey relations since the 2015 refugee crisis. Research for the conference contribution was inter alia conducted in the framework of the INSITER project. The full programme of the EUSA conference 2017 can be found here. 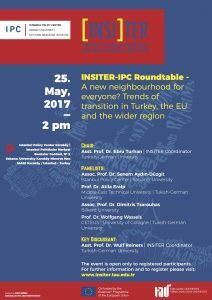 On May 25, 2017, INSITER together with the Istanbul Policy Center (IPC) organises the INSITER-IPC Roundtable “A new neighbourhood for everyone? Trends of transition in Turkey, the EU and the wider region“. The roundtable takes place at 2 pm in the premises of the IPC in Karaköy and brings together academics, students and civil society representatives from Germany and Turkey. The event serves the purpose to approach Turkey-EU relations in a comparative way, focusing on the current internal dynamics and external orientations of Turkey and the EU and tackling the issue of Turkey’s foreign policy and external action of the EU in the wider neighbourhood. It will pay special attention to most recent developments, for instance the Turkish-European cooperation to respond to the refugee crisis, the institutional evolution of the EU, post-Arab Spring dynamics and the political landscape. The event is designed for a limited number of participants including the students of the Master programme “European and International Affairs” of the Turkish-German University. It is open to external participants only upon invitation. For further information please contact the INSITER coordinator Ebru Turhan.